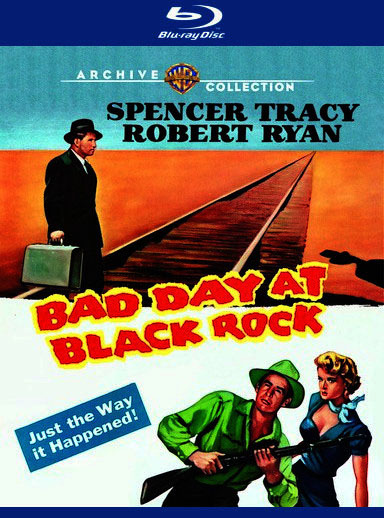 Bad Day at Black Rock opens with a startling long shot of a train shooting through the desert like an angry centipede. There is a feeling of recklessness to the image, as if the hurtling Streamliner could go off the rails from the aggression of its momentum. From that first jarring moment, there is atmosphere of peril in this story of John Macreedy, a World War II veteran with one arm who finds himself faced with hostility and suspicion when he arrives in the isolated town of Black Rock. Now available on Blu-ray from Warner Archive, the film is timelessly tense and full of great performances. Spencer Tracy is the soldier, and the grey-haired, paunchy actor is definitely too long in the tooth for the role, though he is so effective that age almost seems beside the point. His arrival in Black Rock unsettles the locals, because the train hasn't stopped there for four years. When it becomes clear the town will have a visitor, people on the streets bristle, coiling like venomous snakes. Without even knowing the purpose of his visit, they feel threatened. When they learn he wishes to visit the nearby Adobe Flat, they are filled with fear. Macreedy puzzles over their aggression, only certain that they have something to hide and that he needs to find out what that is and what they plan to do about him. Much of the pleasure of Bad Day at Black Rock is in its supernaturally-talented cast, many of them Academy Award winners and nominees. Joining Tracy is Robert Ryan in a terrifyingly controlled performance, Lee Marvin and Ernest Borgnine as a pair of thuggish locals, and Walter Brennan and Anne Francis who are as wary as the rest of the townspeople, but not as hostile. Any one of these performers had the power to make this film special, that they are all together feels like a casting miracle. They play to their various types well and make something more of their familiar personas as a group. In a way, Tracy's advanced age adds a level of tension to his performance. You don't sense in him the efficient utility of a soldier. When buffoons like Borgnine and Marvin bully him, you think he hasn't got a chance. It is clear that he is clever, and that saves him plenty, but with his disability and humble physique, it at first appears that can't be enough to ensure his survival. Then in a scene of remarkably understated, but effective violence, he demonstrates that his resourcefulness is not only in his intellect, but also training and experience that may surpass that of these townspeople who shut themselves off from the rest of the world. The Lone Pines desert locations, used for so many Hollywood films, feel particularly isolated here. Long expanses of dusty sand and brush are surrounded by looming hills, which are beautiful against the blue skies and fluffy clouds, but also oppressive in the way they give the feeling of shutting out civilization. It is a constant reminder of Macreedy's vulnerability, because he is far away from anyone who can help him. Special features on the disc include commentary by film historian and author Dana Polan and a theatrical trailer. Many thanks to Warner Archive for providing a copy of the film for review. To order, visit The Warner Archive Collection.